VIRS ltd has been importing and exporting company of non-ferrous and rare earth metals, elements for plasma spraying and industrial chemicals since 2004. We are dealers of domestic and foreign producers. We supply goods to large industrial enterprises. At the present time we have broad experience in metal-trading field. Research of consumer demand and numerous references of our clients give an opportunity to keep up the adequate warehousing level, to use the best efficient sales procedures and the most prompt supply chain. Main principles of our business are: to provide optimal relationship of price and quality of the goods delivered in proper time; to be an effective and reliable assistant in product choice to our clients. 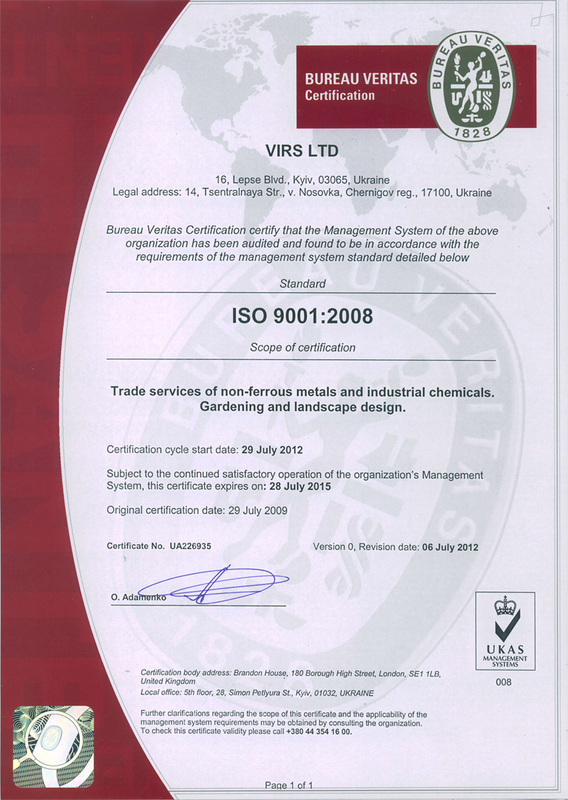 VIRS Ltd successfully finished ISO 9001:2008 certification in 2009 and was granted ISO-certificate UA226055. BUREAU VERITAS carried out the independent international certificate audit. Thereby every employee is responsible for work on hand, watches over the quality of the work and improves process directed by.